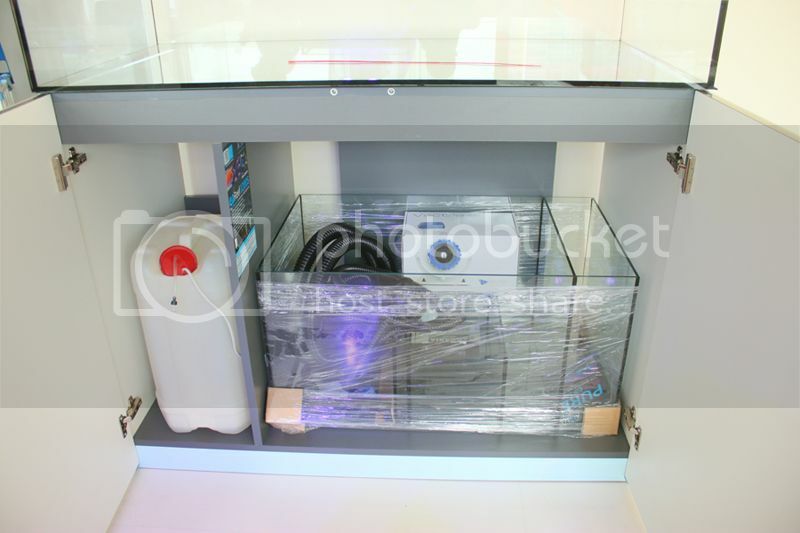 Evolution Aqua 1200S - approx 48" x 24" x 18"H - roughly 95G including sump. The cabinet/stand is nothing special. But the display is really nice. The work on the glass and silicone is excellent. ATI Essentials. This is a new offering from ATI; it is essentially similar to balling lite. This will be a very slow build. I have literally no time. 3 kids...4th on the way...and work being ever so busy. In fact I was forced to accept delivery of the tank several weeks early as the LFS is sadly closing down and my tank had already been sitting in the store over 4 or 5 weeks. 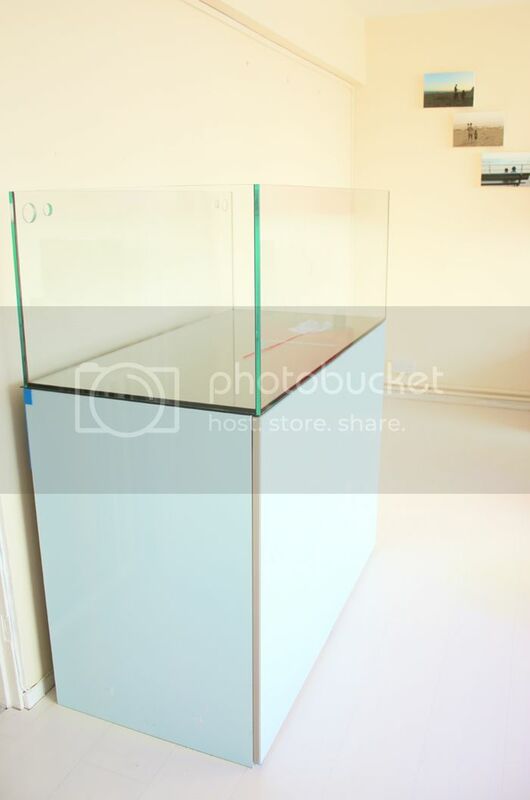 The current 47G tank was moved across the room last week so that I could accept delivery of the new tank and could transfer the stock over slowly. Both tanks will be running until I am satisfied the filtration is ok and the parameters stable. The fish stock will be kept low-moderate. One of the reasons for the upgrade was so that I could keep a Regal Angel and a Convict Tang as well as provide more space for my feminus wrasse. Nice Sahin, just got the 1500 pro recently myself. You won't be disappointed. Very nice looking tank. I've seen them in the flesh and they certainly look well made. Are you going to be adding a background? Nice one Sahin, tough one for NAV on his store shutting down. what not MH in the hood. well you could mod it in the future. I thought my Nuvo had clean lines... That tank is insane. Looking forward to seeing it full. Wow Sahin, this is going to be SWEET! I can't tell you how envious I am of your 18" height, we'll have the same footprint but that extra 2" will be great. Mate you've obviously got time! Maybe add a telly to your list of purchases? But seriously, looks really neat. Look forward to seeing what you do with it! Looks great, Sahin! Good luck with this build! Very much looking forward to watching this one take shape. I'll be following your thread and I'm very curious about the DVH All-in-one Biopellets. Very nice. Looking forward to it. Still waiting to hear a bit more about your AEFW protocol you had mentioned. Find More Posts by Jim Z. Note: I did not hear Apex or other controller!? Four kids!!! got to get one....please. Must to have place for our KH Guardian! Deep ocean, mother of life. Looks great Sahin. Definitely following along. Don't muddy up that pretty tank by adding water/coral to it. Just leave it as it is! Congrat! Very nice upgrade. It is going to look great with corals. 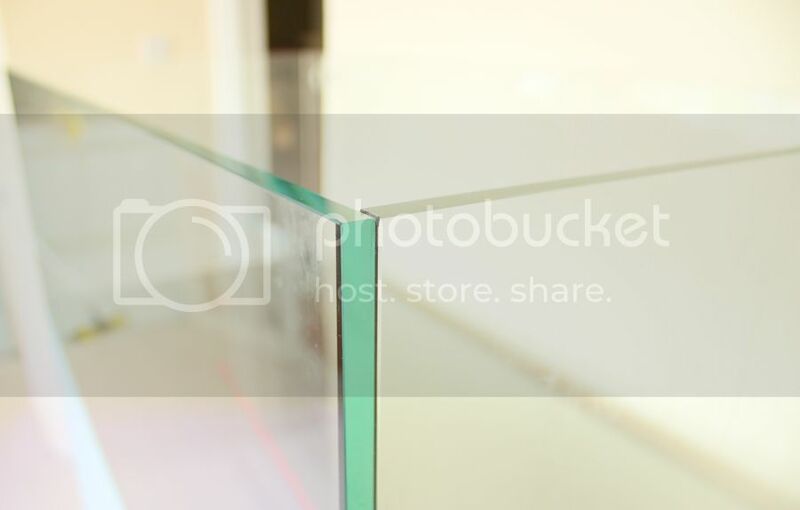 Beautiful crisp lines on that rimless. Definitely following.